So Fred graduated high school and moved to Edinboro University of Pennsylvania while I graduated from Waynesburg College and started work (first as an administrative assistant to my local State Representative and then as a counselor at an ARC group home). During the two years we lived apart we engaged in regular correspondence. This was in those halcyon years before email or the internet, and long distance phone calls were expensive. So we wrote real letters. Lots of them. In addition to writing about our day-to-day lives (relationships, school/work, comics, movies, books and music), we began to seriously develop the Shadowlock world. Our letters were full of character sketches, ideas and designs, back-story and plot ideas. We started to see Shadowlock as a more serious vehicle for the kind of stories we wanted to tell (though not too serious... there are lots of remnants of the Hitchhiker's Guide influence). We were young and finding our voices and styles. A lot of what we were reading at that time made it's way into the work. Philosophy and psychology and science fiction and everything else we were into at the time. This was in the mid-80's when the birth of the Direct Market had opened comics up to a whole new world of small press publishers. We were devouring this influx of material from new creators and seeing possibilities for comics beyond what Marvel and DC had offered. All of this went into our work as well. Books like Love and Rockets, Nexus, Grimjack, Elfquest, Cerebus, Mage, Grendel and Zot! (among many, many others), provided a direct influence on the way we wanted to make comics, if not in terms of actual content or art, then in terms of storytelling and approach. There was an unprecedented movement in the small press that allowed for more idiosyncratic visions and creative control and we wanted to be a part of it. In 1986 I was burned out with my job at the ARC and decided it was time to avoid the real world for awhile and go back to grad school. Edinboro was an obvious choice. Fred was there. I had made several trips to visit him and met a lot of people. There was an open space at the apartment he was living in (Fred, me, and four other guys... it was one of those college apartments. Lots of stories and possible fodder for further blogging). Edinboro also had a pretty highly-rated graduate Psychology program (plus, they gave me an assistantship that paid for most of my tuition there and gave me a stipend to live on), though, to be fair, that was really a secondary consideration. I moved there in the fall of 1986. It has been said that 1986 was “The Best Year in Comics, Ever!” and I'm inclined to agree. There are lots of reasons for this. Batman: The Dark Knight Returns and Watchmen were both released. The John Byrne relaunch of Superman came out. The first trade paperback collection of Maus came out (it would eventually win the Pulitzer Prize). 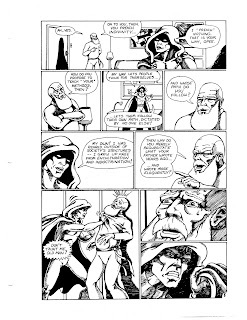 But another reason for that was what has come to called the “Black and White Comics Explosion of 1986.” The first black and white issue of Teenage Mutant Ninja Turtles were first printed in 1984, and by 1986 the creators, Kevin Eastman and Peter Laird, were well on their way to becoming millionaires. There are lots of reasons for this that are too complex a part of comic book history to go into in detail here (ask my students). One of the results of this success is that everyone who could hold a pencil wanted to produce a black and white comic with the belief that they too could become fabulously wealthy. In the short term comic shops stocked everything so they too could cash in on the next big thing. By doing so they created a market where almost anything of any quality, or lack thereof, could be moderately successful. Don't try the phone numbers. I'm pretty sure they don't work anymore. We were stoked, to say the least. Now I'm pretty sure that unless you knew us then, or have heard my stories before, you've never heard of Showcase Publications. Even in the middle of the B&W explosion they were pretty small potatoes. But it was a chance to be published. 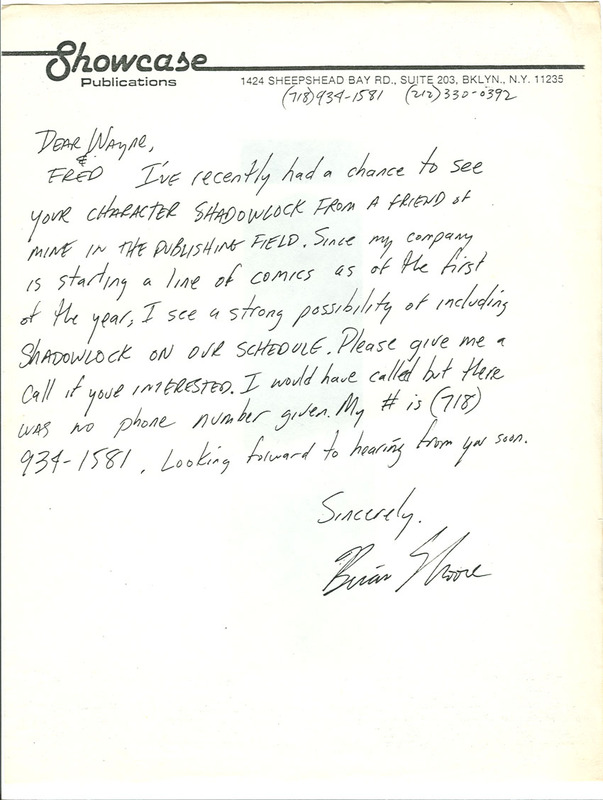 We called and talked to Brian (whose last name I don't remember and can't decipher from the letter), and signed a contract with Showcase Publications. Shadowlock was about to become a published reality. 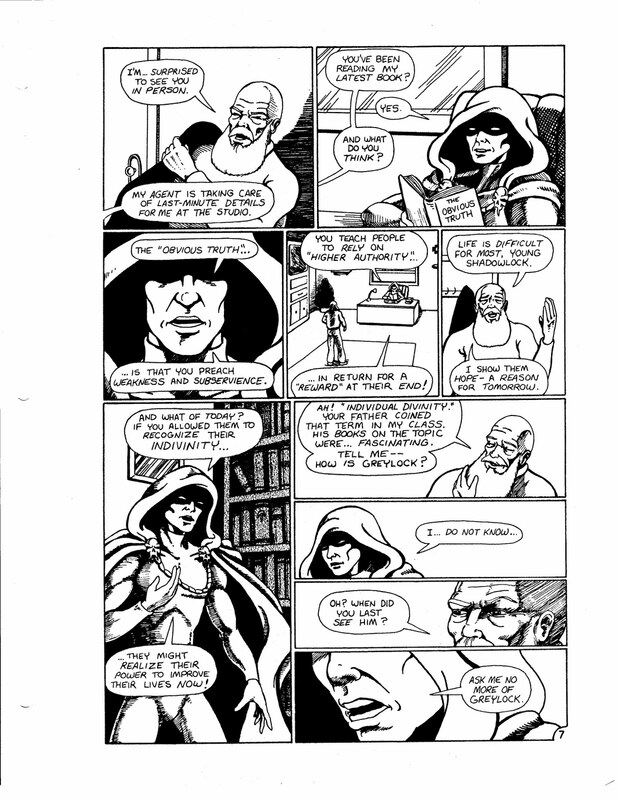 Somehow, in the middle of both of us being in college (my first semester of grad school, the most difficult academic semester of my life), we managed to write and draw thirty-two pages (a main story and a back-up feature) of Shadowlock #1. We were still finding our style (as the following pages show). This was at a point where we both wanted to do a little bit of everything. As a result the art is a mishmash of styles. There are panels that I pencilled and Fred inked. There are panels that Fred pencilled and I inked. There are panels that are a mix of both. The inking is a mix of tech pens, quill pens and brush. Neither of us had really developed that skill set with any tool yet. Other than that it's difficult to break down who did what in our creative process. We worked on layouts and dialog together, just doing thumbnails and throwing words at each other until we agreed on something. We never really had a problem with egos on any project we've ever worked on together. In general I'm willing to say that probably the majority of the characters (and at least their initial design), and the overall, long-term plot of the book came from me. Fred was much better at the details, fleshing out the cultures and their philosophies, as well as the architecture, clothing styles and the spaceship designs. He added personal details to the characters. This is a generality and Fred certainly created his share of characters (Lesterfarr key among them), and I added my share of the rest of the stuff. Somehow it all came together. We mailed our package of materials to Showcase and waited for the first issue to hit the stands. In the meantime, we were out there promoting our book. We had met a number of other small press publishers and creators at conventions. That was a magical time. We all believed we were on the forefront of something big in the comic book world. At Mid-Ohio Con in 1986 there was a tremendous sense of small press and community and camaraderie. We were all mutually supportive and excited to be a part of the process. We exchanged artwork, writing and art tips, and experiences with publishing. We hobnobbed with the big name stars at the Con (we had drinks with Frank Miller at our table at the Holiday Inn in Mansfield, Ohio), and they were friendly and supportive. Fred and I were actually the featured guests at a few local cons. This was a mixed blessing. It was cool to finally be on the “comics professional” side of the table, and promoting our work was important. But, the downside is, other than our art, we had nothing to show. 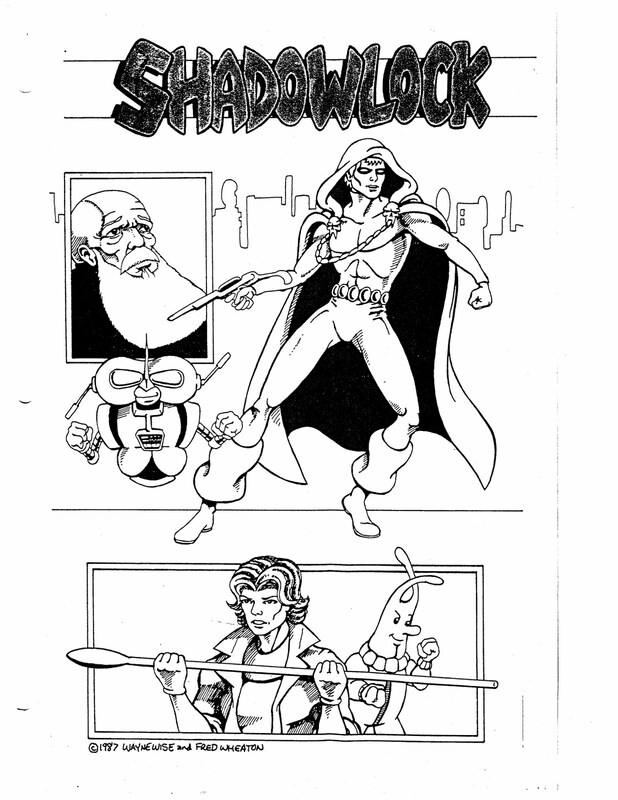 Shadowlock #1 was still being produced at the time this was all happening. We didn't have the actual comic book in our hands to promote. We never got one either. 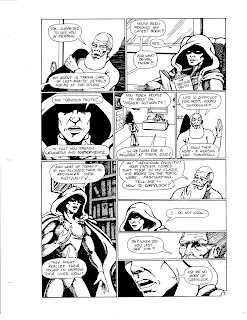 Showcase Publications, like a lot of other companies, went belly-up during the“Great Black and White Comics Implosion of 1987” before our book was ever sent to the printer. We were devastated, of course. We weren't the only ones. 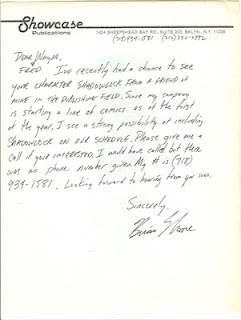 The next year at Mid-Ohio Con, 1987, there were a lot of disappointed small press comics creators. The excitement of the previous year was gone and so were most of the books. We all commiserated, supportive in our failure as we had been in our dreams. We got our art back from the publisher. I knew some people who didn't. We lost no money, only time, and I still see that as a worthwhile investment in our art. We produced a lot of pages and met a deadline. We learned a lot about the art of comics. In retrospect, as disappointing as it was at the time, I'm glad no one actually saw the finished product. Shadowlock #1 was incredibly amateurish. Like a lot of the people who published B&W comics in 1986 we simply weren't ready. We weren't working at a professional level, and Showcase Publications was simply trying to cash in on a fad while they could. This disappointment forced us to retreat and to rethink our entire approach to the story. The B&W small press comics phenomenon also retreated, went underground and became the mini-comics movement of the late 80's. By then we were better artists, better writers, and better storytellers. We were a little smarter for our experiences as well. 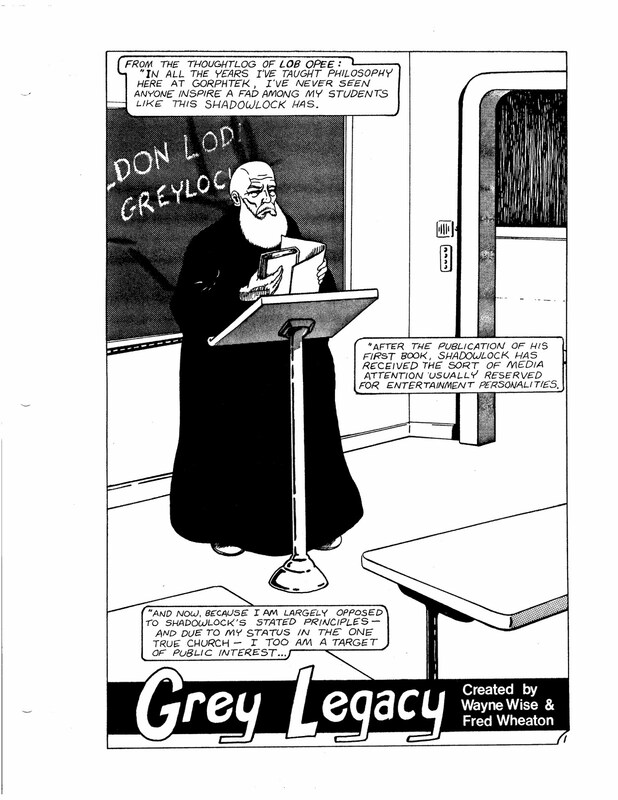 Shadowlock had morphed into a bigger, better project called Grey Legacy. Ah, to come back to the Blogspot for these is quite a treat. As I said in my latest blog -- it's for the love. Beyond just that, I really feel for you when you talk about your highs and lows being matched equally in camaraderie in this field. It's something comic book people are good at: Being good people.